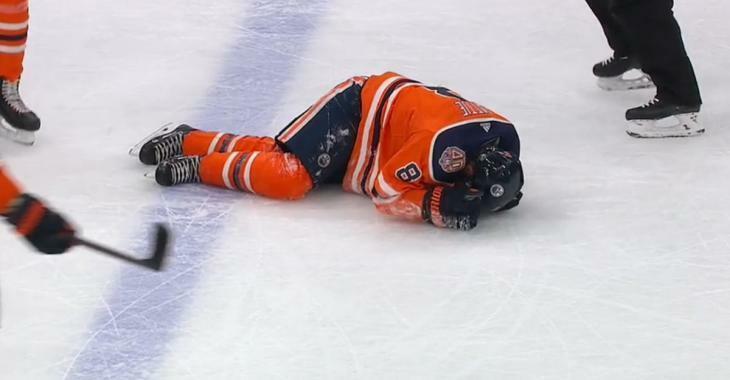 Videos : Oilers forward Ty Rattie goes down hard on Saturday. Oilers forward Ty Rattie goes down hard on Saturday. Big loss for the Oilers. The Edmonton Oilers simply can not catch a break, and even when they do it seems like fate just conspires against them to make sure that is very short lived indeed. On Saturday night the Oilers were at home in Edmonton when they welcomed the San Jose Sharks to Rogers Place. Unlike most teams however the Oilers were likely very anxious about playing in front of their home crowd as they have had a terrible run of success as of late in their home arena. Unfortunately for the Oilers Saturday night thus far has proved to be no different. Not only are the Oilers currently struggling against a big deficit that they have built for themselves with the Sharks up 3 - 1 at the time of this writing but they also appear to have lost one of their top line players and the timing of it is just so Edmonton Oilers. It appears that forward Ty Rattie, who has surprisingly seemed to mesh relatively well with Connor McDavid's top line, will be out of the line up for some time if his body language is any indication of how seriously he is injured. With literally less than 1 second left on the game clock during the game's very first period, Rattie sacrificed his body in an effort to prevent a point shot from the Sharks from getting through to the Oilers net. There were several problems with Rattie's decision however and it seems that his sacrifice may end up costing the Oilers much more than his one blocked shot would have had it been allowed through. The first problem was that San Jose Sharks defenseman Tim Heed looked like he got everything on his shot and fired off an absolute rocket from the blue line, the other was that Rattie appeared to expose the vulnerable part of his leg to the shot which as you would expect made for a very bad combination. Rattie immediately collapsed to the ice as soon as the puck hit him and he appeared to be in an incredible amount of pain, unable to regain his feet without the help of his teammates. Even when he got to the bench Rattie was unable to walk down the tunnel and literally had to be carried down the tunnel by a member of the Oilers training staff. The Oilers have confirmed, to no one's surprise, that Rattie will not be back tonight.